Driving from Germany to Turkey (Istanbul) takes about 40 hours depending on where in Germany you start your journey. The route includes passage from 6 countries; Chezch Republic, Austria, Hungary, Serbia, Greece or Bulgaria. The route from Munich, Germany to Istanbul has been named historically the “Gastarbeiter route”. This traditional route has been used and still in use by guest workers from Turkey and Greece who used to work in Germany, Belgium, Netherlands and other western European countries. 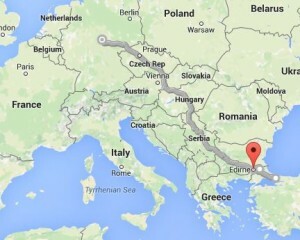 The traditional route includes; Austria, Hungary, Serbia or Romania, Greece and or Bulgaria. The entry to Turkey is mainly from Kapikule border with Greece near Edirne. From Edirne there is a pretty new and well maintained highway to Istanbul. From Edirne you drive through Kirklareli and Tekirdag towards Istanbul.